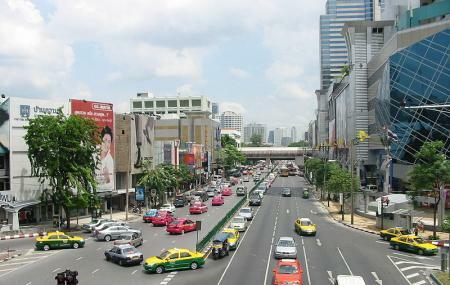 Thanon Phaya Thai, or the Phaya Thai Road is one of the most important road intersections in Bangkok. It starts from the Sam Yan Intersection in the Pathum Wan District and runs down to Victory Monument in the Ratchathewi District. This road also intersects with the it intersects with Rama IV Road at Sam Yam. This road runs directly below the Sukhumvit Line of the BTS Skytrain and hence can good accessibility. This area is a mix of commercial and residential district with many cheapo shopping options and great restaurants. Phaya Thai, best known for wholesale clothes shopping malls, is located here. Other malls located here are Pratunam Market, Platinum Fashion Mall, Palladium Mall, and Pantip Plaza. The Rock Pub and Coco Walk are great places to enjoy the Bangkok nightlife at Thanon Phaya Thai. Most of the Bangkok tours skip a visit to this place, but you can create your customized plan if you wish to visit Thanon Phaya Thai. Fine Accommodation options like Ibis Bangkok Riverside, Kokotel Bangkok Surawong, Marvin Suites and Check Inn China Town By Sarida will meet your requirement of where to stay in Bangkok. How popular is Thanon Phaya Thai? People normally club together Tha Chang Wang Lang Pier (tha Chang) and Thanon Wang Lang while planning their visit to Thanon Phaya Thai.